Americans' access to digital books may be growing, but they still like to feel their Bibles in their hands. A new Barna survey shows that 89 percent of Bible users in the United States read a physical version – a percentage that has remained steady the past eight years. 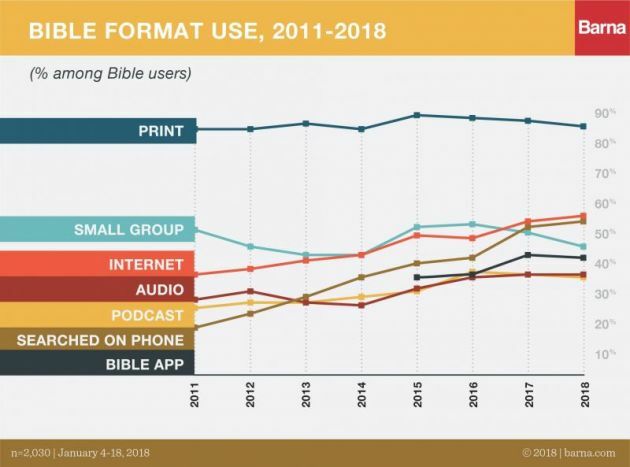 Reading the Bible on the Internet (57 percent) and on a smartphone (55 percent) remains popular, but the Barna report said Americans' usage of a physical version is noteworthy. Barna conducted its annual State of the Bible survey, in partnership with American Bible Society, to examine behaviors and beliefs about the Bible among U.S. adults. The results posted July 10 show that, despite shifting cultural trends, Americans still read the Word, and it remains a powerful, transformative tool in their life. These and other snapshots are included in our list of top seven findings from this year's State of the Bible report. "Little has changed in the preference for a physical copy of the scriptures in the last eight years since tracking began," the Barna report said. The survey findings are similar to those of a 2016 Pew Research Center survey, which found that 65 percent of Americans prefer a physical book and 28 percent an e-book. For Bible users, the appeal of a print version of the Bible remains high at almost nine in 10 (89 percent), said Barna. Little has changed in the preference for a physical copy of the scriptures in the last eight years since tracking began, the survey said. Although use of digital formats is also the same as in 2017, in general, use has steadily climbed since 2011. More than half of users now search for Bible content on the internet (57 percent) or a smartphone (55 percent), and another 42 percent use a Bible app on their phones. * 48 percent of Americans are considered Bible users. This is defined by Barna as using, listening to, praying or watching the Bible text in any format at least three to four times a year, outside of a church service. * 66 percent of Americans "express at least some curiosity to know more about what the Bible says," including 29 percent who express a strong desire. * 58 percent of Americans "believe that the message of the Bible has transformed their lives." "Americans still read the Word, and it remains a powerful, transformative tool in their life," the report said. Bible use has remained relatively consistent since 2011. Adults who use the Bible daily account for 14 percent of the total adult U.S. population, followed by 13 percent who use it several times a week, 8 percent who do so once a week, 6 percent about once a month and 8 percent who use it three to four times a year. For Bible users, the appeal of a print version of the Bible remains high at almost nine in 10 (89 percent). Little has changed in the preference for a physical copy of the scriptures in the last eight years since tracking began.